Note: We've added a great new product to our online store, BJI contributing writer Kenneth Smith's new Advanced Strategy Cards For Card Counters. 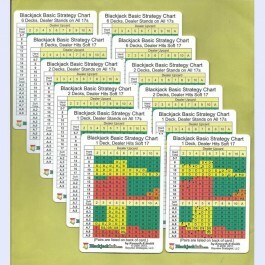 If you are a card counter, or thinking of becoming one, you need to read Ken's article in this issue (and next month) for the details on what these new strategy cards entail, and how to use them on the tables (or for practicing card counting at home). Ken spent the better part of two months developing the index numbers for the cards. (Trust me, you won't find a more accurate set of indices based on the playing rules and the number of the decks, anywhere.) These cards are a winner and we have them on sale! This article by Fred Renzey appeared in issue #77 and it offers practical advice for card counters on what bet spreads to use for multi- and single/double deck-games with tips on when to play two spots. E-mail subscribers can also read each month's issue online at our web site: BJI Issue #159, April 2013. "These new Advanced Blackjack Strategy Cards focus on six different rule sets and provides an optimized basic strategy for each of the games, just like our popular basic strategy set. However, that's just the beginning..."
"Part 2 of my report on the 2013 Blackjack Ball contains the answers to the written test, a brief description of some of the card counting contests, and who won the coveted Grosjean Cup..."
"You have no idea how huge this is to a player to be in the company of these famous blackjack celebrities. These are the men who invented, improved, or handed down card counting directly to me (and just about everyone else in the room)..."
"In this, the last of a three-part report on the blackjack playing conditions in downtown Las Vegas, we will visit The Golden Nugget, Main Street Station, Plaza, and finally the Las Vegas Club..."
"On Saint Patrick's Day, instead of pondering the plight of post-modern civilization over Guinness or Irish whisky, listening to U2 cover bands in a bar filled with auburn-haired lovelies in short green skirts, I instead found myself deep in the Southern end of the Las Vegas Valley..."
"You gotta love going to Tunica. It's an attractive spot for low-rollers, with $10 DD blackjack, decent video poker pay tables, and easy comps. This includes..."
"Frank Scoblete and Jerry "Stickman" visit all the casinos in AC in a one-day Odyssey. Their adventure begins at a hotel room in Philadelphia where..."
"Tilton describes a team play that he pulled off at the Foxwoods Resort and Casino..."
"From a viewpoint of pure probability, when measuring the chances of receiving a particular card in a particular seat, any blackjack seat is as good as any other. Period. 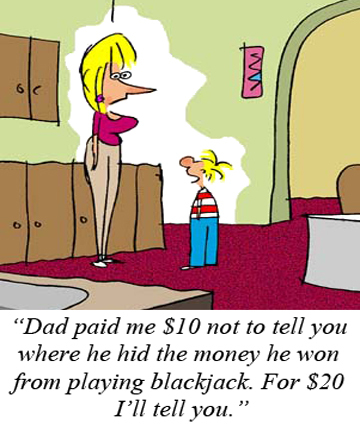 This is true even when you're counting cards. However, third base (or any position later than first base) is actually statistically preferable. How do those facts fit together? Actually, quite neatly..."